Huawei has been very aggressively positioning itself across segments this year. The Nova series has been targeting the young buyer with an intelligent mix of features and design. The latest offering in that series is the Nova 3. I spent time with this device and here is my review of this phone. The first thing that stands out about the phone is the design. Huawei has come up with a great looking phone that also feels premium. The dual tone color is psychedelic and the way the light plays on the surface is brilliant. There is an added benefit that when you use the phone, people definitely notice it and it becomes a conversation starter. The phone’s colour gradually shifts shade from a deep purple to a chrome blue as you go from bottom to top. The colour change is also very visible when you hold it in different angles creating brilliant lines of light. The phone has a metal frame holding the glass front and back together. While the glass makes it look cool and all that, there certainly is the smudging and perceived loss of durability that comes with it. There are people who will swear by metal back phones and think twice about glass phones. 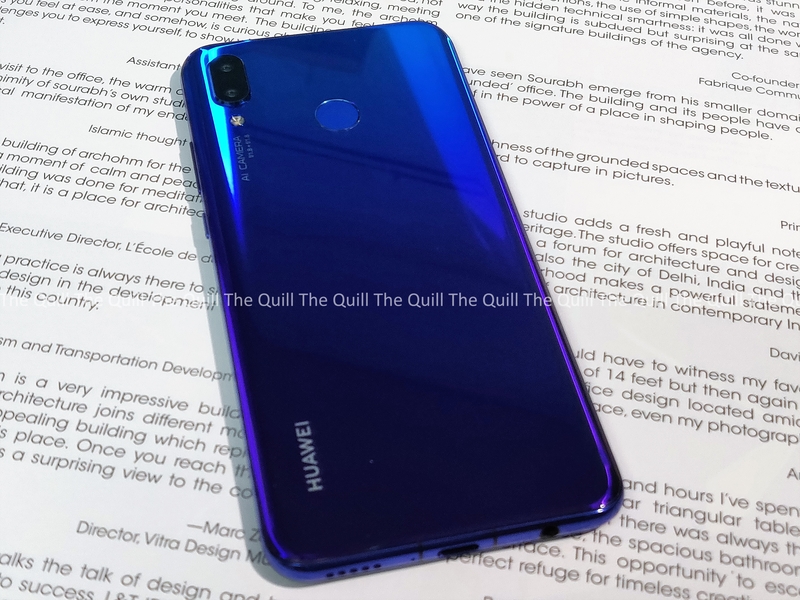 The Huawei Nova 3 takes the same design language as the Honor 10 and the Huawei P20 Pro to the next level. The Huawei Nova 3 is a tad bit thinner than the OnePlus 6. Both these phones definitely feel fantastic to hold, but the OnePlus 6 has a slight edge over it when it comes to the ability to grip it and hold it freely. 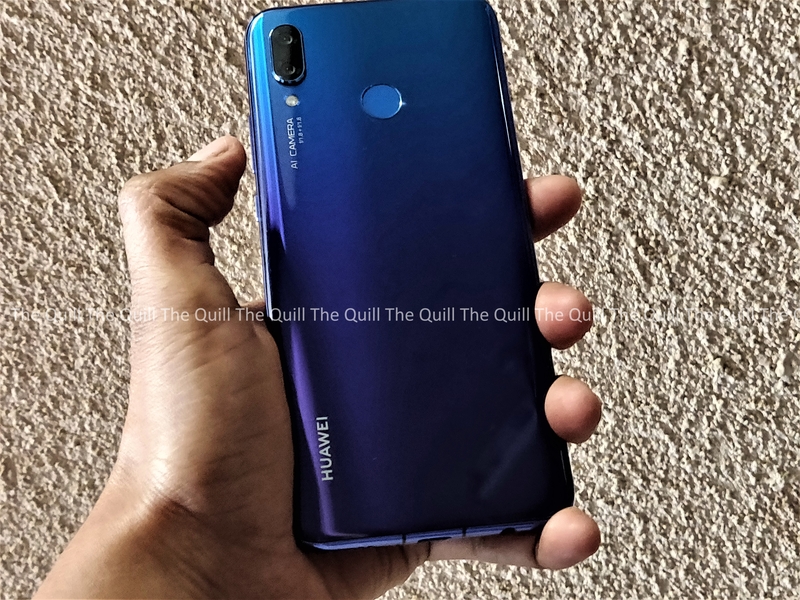 The Huawei Nova 3 beats any premium smartphone in crafting and design. The buttons on the side have a great tactile response. The fingerprint scanner is conveniently placed on the back and right at the center where your index finger would naturally find it. Like other Huawei phones, it’s very fast and accurate to unlock the phone. 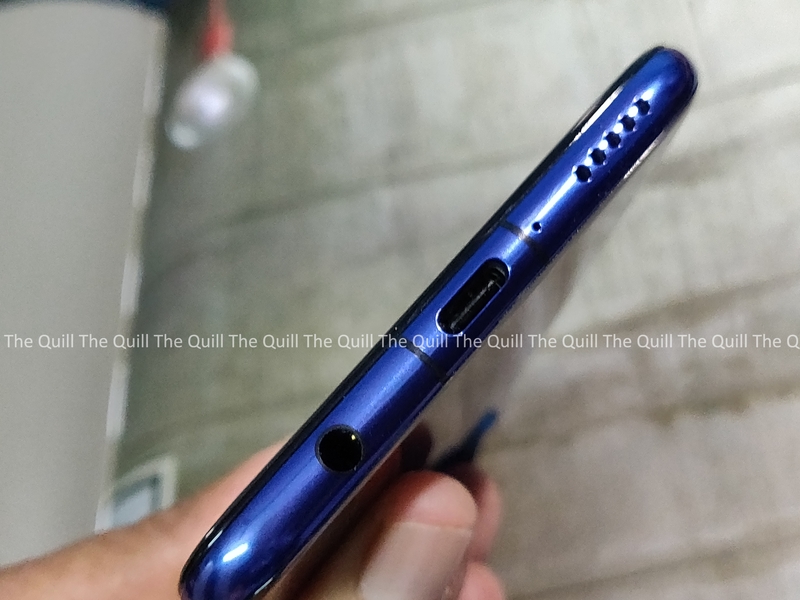 The phone thankfully has the 3.5mm jack which is a welcome move for phones targeted towards the mainstream buyer who needs to connect to conventional earphones. There is a USB Type-C jack at the bottom as well, but notably, the phone doesn’t officially support fast charging. The antenna bands on the Huawei are generally quite different in performance and very subtle in the design. There are areas in Bangalore where I was able to get a very clean and smooth reception over 4G where even top end flagship phones fail to catch a signal. Even hitherto dark spots where having better reception. 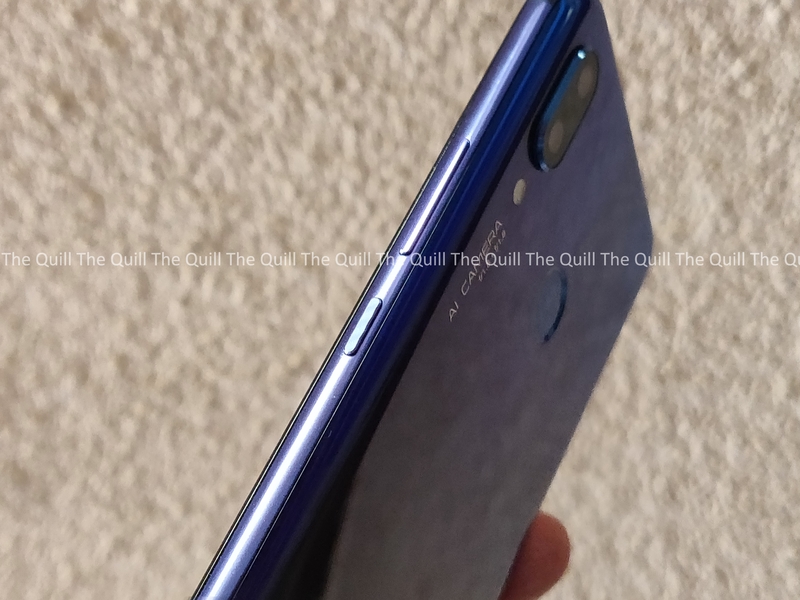 The Huawei Nova 3 is all screen in the front side. I wouldn’t call it bezel-less, it’s very nearly close to being one. 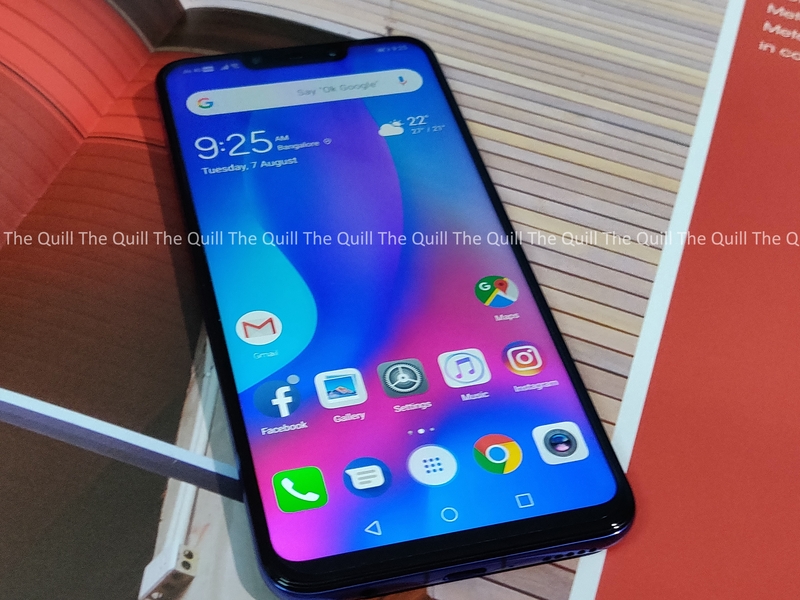 Huawei has managed to increase the screen real estate by putting a notch on the display. The notch has the dual cameras and an IR-sensor that is used to unlock the phone in the dark, apart from a bevvy of other sensors and the top earpiece. The notch is bigger than the one on the OnePlus 6 or the Honor 10. As usual, Huawei gives you the option to hide the notch, but even when you do, the icons continue to occupy the notched area keeping the rest of the screen free for everything else. Essentially hiding the notch results in just cosmetic value addition and actual loss of screen space. The Nova 3’s screen stretches to 6.23-inches diagonally. It’s an IPS LCD panel with FullHD+ resolution, which means the effective pixel density is around 409 ppi. The display serves the phone very well. The brightness levels are good and the colors come out very well. There isn’t any artificial saturation of shades. Sunlight legibility is good and long video loops and gaming are very enjoyable and immersive. The display has a slight edge over the OnePlus 6 in the gaming mode as the AI engine makes things a lot better and faster. My teenage son had a great time gaming and streaming videos with it. Overall great points on the display department. The phone is powered by the flagship HiSilicon Kirin 970 SoC that’s designed in-house by Huawei. The Kirin 970 Soc has an octa-core setup with four Cortex A73 cores clocked at 2.4GHz and four Cortex A53 cores clocked at 1.8GHz. There’s also a co-processor inside to handle AI workloads. Based on the chipset alone, it’s clear that it can’t match the performance of a Snapdragon 845-powered device. But in real life usage, it comes close to the OnePlus 6 and loses out only by a few points. The phone comes with 6GB LPDDR4 RAM and 128GB of UFS storage. There’s also expandable storage support via microSD cards up to 256GB. The performance of the device is very smooth and the phone is able to handle multi-tasking and heavy gaming without any sign of stutter or lag. I tried opening a lot of taxing apps parallel to each other and the phone just went through it like a hot knife through butter. Full marks in the performance department. The phone has four cameras . Two on the back, two up front. At the back is a 16MP primary sensor with f/1.8 aperture along with a 24MP secondary camera that shoots only in monochrome again with f/1.8 aperture. Both have PDAF and thanks to AI chops, the Nova 3 can enhance the details of the photos taken by the hardware. Up front is a 24MP sensor coupled with a 2MP depth sensor for selfies. The camera is able to produce good quality pictures consistently and the colors are pretty sharp and fleshed out. The AI bit sometimes over compensates the saturation but that is just a minor peeve from my end. The front camera is also pretty reliable and gives good selfies that are great to share on social media. Here are a few sample pictures that I took with it. The Huawei Nova 3 has a 3,750mAh battery. The battery very easily lasts over a day on above average use with a mix of social sharing, streaming and democratic gaming with the phone. I was also using WiFi and 4G heavily all along. The call quality is pretty neat and there were no call drops that I saw. The phone supports VoLTE and hence your Jio SIM will work effortlessly with it. At Rs 34,999/- The Huawei Nova 3 is a compelling buy and direct competition to the base version of the OnePlus 6. The phone comes with a standout design and a lot of useful features that the young crowd will love to have. I recommend the Huawei Nova 3 as an all round performer. You will love this device if you want a phone with great design and AI Chops to go with it.